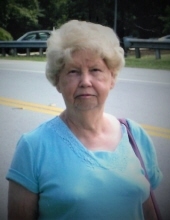 Mrs. Dorothy W. Carter, age 84, of Cedartown, GA passed away Sunday, March 31, 2019 at her residence. She was born in Floyd County, GA on May 10, 1934 a daughter of Arthur Wiggins and Minnie Dempsey Wiggins. Mrs. Carter had lived all of her life in the Floyd and Polk county area where she was a member of the Doyle Road Baptist Church and was a retired employee of the Cedartown Goodyear Mill. Mrs. Carter enjoyed shopping and traveling. In addition to her parents she was preceded in death by her husband, Robert Carter on December 25, 1987 and by three brothers: Jerry, Roy and Walter Wiggins. Survivors include her brother, Paul Wiggins, Sr.; two sisters: Faye Frost and Marie Saitta; a number of nieces and nephews also survive. Funeral services will be held Wednesday, April 3, 2019 at 3:00 pm in the chapel of the Smith & Miller Funeral Home with Rev. Donald Lindsey and Rev. Clinton Green officiating. Interment will follow in the Sanders Cemetery. Pallbearers will include: Chad Vasser, Paul Wiggins, Jr., Randell Wiggins, Andrew Babcock, Christopher Wiggins and Shane Bandy. Bryston Hartley will serve as an honorary pallbearer. The family will receive friends Wednesday from 1:00 pm until 3:00 pm at the Smith & Miller Funeral Home. The Smith & Miller Funeral Home of Cedartown is honored to serve the Family of Mrs. Dorothy Carter. To send flowers or a remembrance gift to the family of Dorothy Carter, please visit our Tribute Store. "Email Address" would like to share the life celebration of Dorothy Carter. Click on the "link" to go to share a favorite memory or leave a condolence message for the family.